Big sign and big target: On Albany’s Ellsworth Street. Oregon has been suffering from one-party government for years now. And if you’re a voter in Senate District 8 (Albany and Corvallis), a super-rich guy in California is counting on buying your vote in order to help cement and prolong our state’s unfortunate fate. That’s my reaction to the news, reported by Jeff Mapes in the Oregonian on Wednesday, that California hedge-fund billionaire Tom Steyer wants to spend truckloads of cash — maybe $100 million from him and other donors — to defeat candidates opposed to the environmentalist agenda, and that a group allied with him has now targeted Sens. Betsy Close, R-Albany, and Bruce Starr, R-Hillsboro, for defeat. As Mapes points out, Starr and Close last year both opposed a bill that would have allowed Oregon to go forward with a low-carbon fuel program. That program was aimed at lowering greenhouse gas emissions, in the vain hope that this would alter the course of global climate change. But its effect would have been to drive up the cost of living for every Oregon family while rewarding investors in alternative fuel programs, which cannot compete without government subsidies. Betsy Close, left, and Sara Gelser with other candidates at Albany City Hall on Sept. 10. 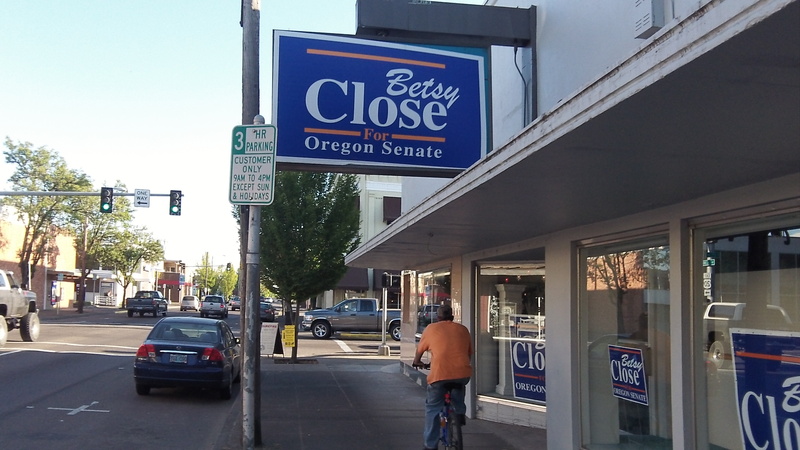 So, for keeping the economic interests of average citizens in mind, Betsy Close can expect to be deluged with a wave of anti-Close campaigning in the few weeks before ballots come out. It’s not as though Rep. Sara Gelser of Corvallis, Close’s opponent, needed any more money in her campaign. As of Wednesday, Gelser had an advantage of two to one in cash contributions and more than two to one in cash on hand. Close had $40,610 left, and Gelser $101,225. Reid rail against big money while they take big money to spread their distorted view of reality. All Dems should be voted out of every office for supporting state and federal policies that have damaged our county. That damage will be felt for years–so let’s throw out the trash now. The Dems are so blinded by the Koch Bros. money they can’t see the many rich donors that contribute to liberal/”progressive” (progressive is in quotes because it isn’t true; collective would be more accurate) causes and candidates. They forget about the George Soroses and Michael Bloombergs of the world, not to mention most of the rich in Hollywood, with their “star” power and the influence they wield simply as a result of that “stardom”) as they influence the “sheep” of our society, who then take those recommendations and with no other information, cast uninformed “votes” based on everything but what they should be based on: the ISSUES. Everyone saw Leo DiCaprio speaking against global warming and pleading for everyone to lower their “carbon footprint” as he gallivants around the globe on one of the most decadent yachts in the world. Can you say hypocrite? Yet more than a few people will do just as he suggests in spite of that hypocrisy. There’s no question that big money has far too much influence in all elections. It would be nice if there were a way to eliminate the effect of big money. Perhaps the best we can do is outlaw RE-ELECTION. More on that if anyone is interested. Career politicians are number 2 on my list of the evils of government.